NOV Navigarion Bar for MonoMax & Xamarin.Mac is a control for implementing navigation menu, similar to the one in Microsoft Office Outlook, in your Mac OS applications. The Navigation Bar consists of panes. 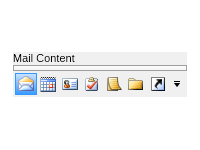 Each pane has Header, Icon and Content. 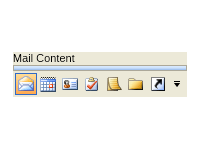 The content of the selected pane is displayed on top of the headers stack. 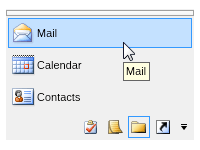 Users can rearrange buttons and choose to show or hide certain buttons. The NOV Mac OS Navigation Bar buttons can be customized at run-time by clicking on the lower drop-down arrow button. By using the splitter bar users can stack buttons into the strip bar located at the bottom of the navigation bar. When buttons overflow they will appear in the drop-down menu for selection. The Content Pane of the Mac OS Navigation Bar can be any NOV UI control (widget). NOV Navigation Bar is styled with CSS. NOV initially comes with the following themes: Windows 8, Windows 7, Windows XP Blue, Windows Classic (with all color scheme variations) and Mac Lion.